Smoking and harmful use of alcohol are amongst the most significant risk factors in the global burden of disease in England. 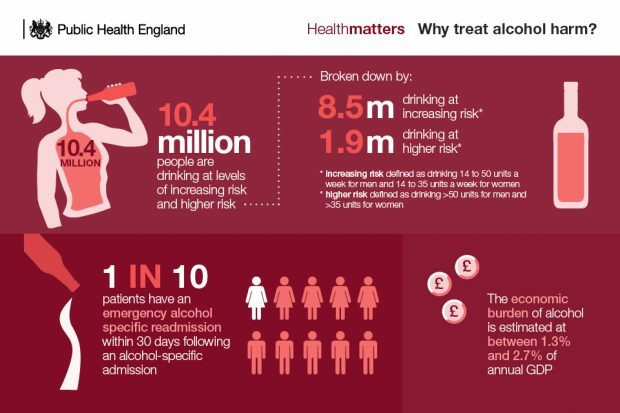 The latest edition of Health Matters, PHE’s professional resource, focuses on preventing ill health caused by tobacco and alcohol use. 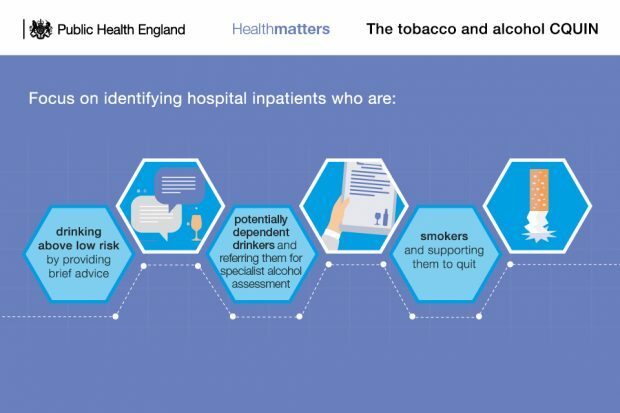 It makes the case for why NHS providers should implement the updated screening and brief advice for tobacco and alcohol use in inpatient settings CQUIN. Smoking is the single largest cause of preventable ill health and premature death, and there are over 6 million people in England who smoke. 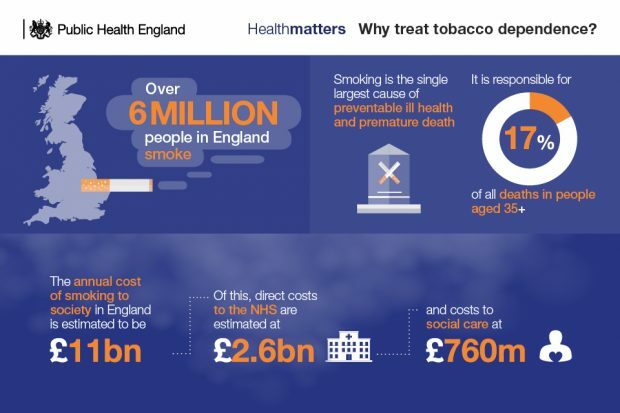 It costs the NHS in England approximately £2.6 billion a year for treating diseases caused by smoking, but every £1 spent on smoking cessation saves £10 in future health care costs and health gains. The NHS Five Year Forward View makes a commitment to make all NHS trusts, both mental health and acute, smokefree by 2020. An estimated 1 in 4 patients in acute hospital beds in England are smokers and the prevalence of smoking in secure mental health units is even higher at 64% of patients. Therefore, a large number of smokers can be reached through health services and in particular hospitals. However, a British Thoracic Society audit has found that this unique opportunity is not being exploited. In England, 10.4 million people consume alcohol at levels above the UK CMOs’ low-risk guideline, increasing their risk of alcohol-related ill health. The economic burden of alcohol is estimated to be between 1.3% and 2.7% of annual GDP, and around three-quarters of the cost to the NHS is incurred by people whose alcohol misuse causes ill health. Alcohol identification and brief advice (IBA) can identify and influence patients who are drinking above low risk. However, the level of implementation is varied across the country and far from the optimal large-scale delivery required to significantly impact on population health. The national CQUIN scheme offers the chance to identify and support adult inpatients who smoke and adult inpatients who are drinking above low risk (excluding maternity admissions). It is intended to complement and reinforce existing activity to deliver short, simple and evidence-based interventions to smokers and those who use alcohol at increasing risk and higher risk levels. The CQUIN applies to community, mental health and acute providers, and aims to help providers to implement NICE guidance on reducing smoking in acute and mental health settings and preventing alcohol use disorders. 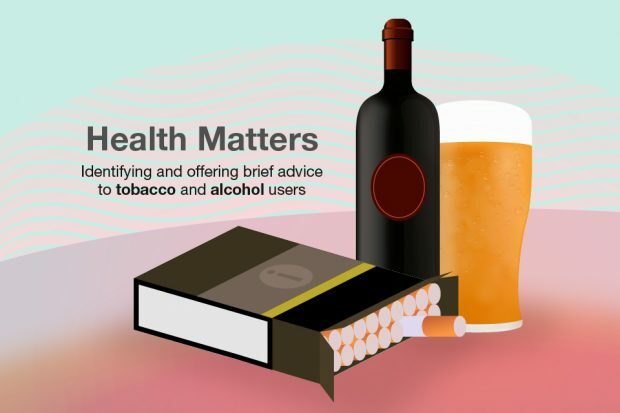 This edition of Health Matters sets out the indicators for this CQUIN, and what very brief advice (VBA) for smoking cessation and alcohol identification and brief advice (IBA) entails. It also provides case studies that exemplify how the CQUIN has been implemented effectively. For this CQUIN to be effective, all health professionals need to play their part. Clinical commissioning groups, local authorities, mental health and community trusts, and acute trusts also play an important role in implementing and progressing the CQUIN. This edition of Health Matters sets out some actions that each of these roles can take.